چهار غول گازی منظومه خورشیدی در پس‌زمینه خورشید، در مقیاس صحیح‌شان. غول‌های گازی منظومه خورشیدی: مشتری (هرمز)، کیوان (زحل)، اورانوس، نپتون. غول‌های گازی (یا سیارات مشتری‌سان) سیارات بزرگ و گازی هستند که عمدتاً از سنگ یا مواد جامد دیگر تشکیل نشده‌اند. چهار غول گازی در منظومه خورشیدی وجود دارد: مشتری (هرمز)، زحل (کیوان)، اورانوس، نپتون. علاوه بر این، غول‌های گازی فراخورشیدی بسیاری تاکنون شناخته شده‌اند که اطراف ستاره‌های دیگر در حال گردش‌اند. ↑ jovian planet. برابرنهاده فرهنگستان زبان فارسی. For the band, see Gas Giants (band). A gas giant is a giant planet composed mainly of hydrogen and helium. Gas giants are sometimes known as failed stars because they contain the same basic elements as a star. Jupiter and Saturn are the gas giants of the Solar System. The term "gas giant" was originally synonymous with "giant planet", but in the 1990s it became known that Uranus and Neptune are really a distinct class of giant planet, being composed mainly of heavier volatile substances (which are referred to as "ices"). For this reason, Uranus and Neptune are now often classified in the separate category of ice giants. 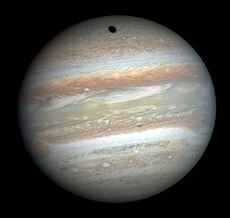 Jupiter and Saturn consist mostly of hydrogen and helium, with heavier elements making up between 3 and 13 percent of the mass. They are thought to consist of an outer layer of molecular hydrogen surrounding a layer of liquid metallic hydrogen, with probably a molten rocky core. The outermost portion of their hydrogen atmosphere is characterized by many layers of visible clouds that are mostly composed of water and ammonia. The layer of metallic hydrogen makes up the bulk of each planet, and is referred to as "metallic" because the very large pressure turns hydrogen into an electrical conductor. 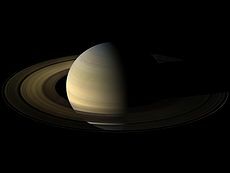 The gas giants' cores are thought to consist of heavier elements at such high temperatures (20,000 K) and pressures that their properties are poorly understood. The defining differences between a very low-mass brown dwarf and a gas giant (estimated at about 13 Jupiter masses) are debated. One school of thought is based on formation; the other, on the physics of the interior. Part of the debate concerns whether "brown dwarfs" must, by definition, have experienced nuclear fusion at some point in their history. The term gas giant was coined in 1952 by the science fiction writer James Blish and was originally used to refer to all giant planets. It is, arguably, something of a misnomer because throughout most of the volume of all giant planets, the pressure is so high that matter is not in gaseous form. Other than solids in the core and the upper layers of the atmosphere, all matter is above the critical point, where there is no distinction between liquids and gases. The term has nevertheless caught on, because planetary scientists typically use "rock", "gas", and "ice" as shorthands for classes of elements and compounds commonly found as planetary constituents, irrespective of what phase the matter may appear in. In the outer Solar System, hydrogen and helium are referred to as "gases"; water, methane, and ammonia as "ices"; and silicates and metals as "rock". Because Uranus and Neptune are primarily composed of, in this terminology, ices, not gas, they are increasingly referred to as ice giants and separated from the gas giants. Gas giants can, theoretically, be divided into five distinct classes according to their modeled physical atmospheric properties, and hence their appearance: ammonia clouds (I), water clouds (II), cloudless (III), alkali-metal clouds (IV), and silicate clouds (V). Jupiter and Saturn are both class I. Hot Jupiters are class IV or V.
A cold hydrogen-rich gas giant more massive than Jupiter but less than about 500 M⊕ (1.6 MJ) will only be slightly larger in volume than Jupiter. For masses above 500 M⊕, gravity will cause the planet to shrink (see degenerate matter). Kelvin–Helmholtz heating can cause a gas giant to radiate more energy than it receives from its host star. Although the words "gas" and "giant" are often combined, hydrogen planets need not be as large as the familiar gas giants from the Solar System. However, smaller gas planets and planets closer to their star will lose atmospheric mass more quickly via hydrodynamic escape than larger planets and planets farther out. A gas dwarf could be defined as a planet with a rocky core that has accumulated a thick envelope of hydrogen, helium and other volatiles, having as result a total radius between 1.7 and 3.9 Earth-radii. The smallest known extrasolar planet that is likely a "gas planet" is Kepler-138d, which has the same mass as Earth but is 60% larger and therefore has a density that indicates a thick gas envelope. A low-mass gas planet can still have a radius resembling that of a gas giant if it has the right temperature. ^ D'Angelo, G.; Lissauer, J. J. (2018). "Formation of Giant Planets". In Deeg H., Belmonte J. Handbook of Exoplanets. Springer International Publishing AG, part of Springer Nature. pp. 2319–2343. arXiv:1806.05649. Bibcode:2018haex.bookE.140D. doi:10.1007/978-3-319-55333-7_140. ISBN 978-3-319-55332-0. ^ a b Burgasser, A. J. (June 2008). "Brown dwarfs: Failed stars, super Jupiters" (PDF). Physics Today. Retrieved 11 January 2016. ^ Science Fiction Citations, Citations for gas giant n.
^ D'Angelo, G.; Durisen, R. H.; Lissauer, J. J. (2011). "Giant Planet Formation". In S. Seager. Exoplanets. University of Arizona Press, Tucson, AZ. pp. 319–346. arXiv:1006.5486. Bibcode:2010exop.book..319D. ^ a b Seager, S.; Kuchner, M.; Hier-Majumder, C. A.; Militzer, B. (2007). "Mass-Radius Relationships for Solid Exoplanets". The Astrophysical Journal. 669 (2): 1279–1297. arXiv:0707.2895. Bibcode:2007ApJ...669.1279S. doi:10.1086/521346. ^ Patrick G. J. Irwin (2003). Giant Planets of Our Solar System: Atmospheres, Composition, and Structure. Springer. ISBN 978-3-540-00681-7. ^ "Class 12 – Giant Planets – Heat and Formation". 3750 – Planets, Moons & Rings. Colorado University, Boulder. 2004. Retrieved 2008-03-13. ^ Feng Tian; Toon, Owen B.; Pavlov, Alexander A.; De Sterck, H. (March 10, 2005). "Transonic hydrodynamic escape of hydrogen from extrasolar planetary atmospheres". The Astrophysical Journal. 621 (2): 1049–1060. Bibcode:2005ApJ...621.1049T. CiteSeerX 10.1.1.122.9085. doi:10.1086/427204. ^ D'Angelo, G.; Bodenheimer, P. (2016). "In Situ and Ex Situ Formation Models of Kepler 11 Planets". The Astrophysical Journal. 1606 (1): in press. arXiv:1606.08088. Bibcode:2016ApJ...828...33D. doi:10.3847/0004-637X/828/1/33. ^ Cowen, Ron (2014). "Earth-mass exoplanet is no Earth twin". Nature. doi:10.1038/nature.2014.14477. این صفحه آخرین‌بار در ‏۲۷ اوت ۲۰۱۸ ساعت ‏۱۳:۲۶ ویرایش شده‌است.